I’m sure there are quite a few of you who see this word and don’t have one clue what it means. Or you heard it on the web before -- something to do with making up stories from popular TV shows and movies. If you’re like me, you know exactly what fanfiction is because you lived and breathed it. When I was in high school I spent the majority of my time reading and writing Harry Potter fanfiction. Fanfiction is the writing of stories based on an already existing work of fiction, whether that be books, movies, TV shows, or anything. However, these stories are not written by the creator; they’re written by the fans. 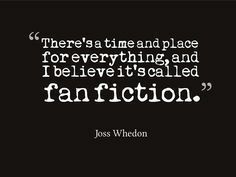 Fanfiction first started to gain popularity with the original Star Trek TV series, which has an extremely large fanbase since the 1960s. Since then popular works of fiction such as Star Wars, Twilight, and Harry Potter have joined the ranks of major fanfiction creations. Since then fanfiction writers have created hundreds of terms and rules for the content. Words and acronyms like canon, OTP, AU, One-shot, Mary Sue, Crossover, ship, fluff, and many more are all a part of this phenomenon. The fact that these stories are not written by the original creator/author can lead to several problems. One ongoing debate is whether these works are considered fair use. Yet, fanfiction is the same as fanart: both are creative works based on the original ideas of another person. Not to mention, nobody is claiming these creative outlets are owned by those who are not the author. For example, if a fan is writing about Supernatural, everyone who is reading and sharing their story knows that the real credit of the TV show lies on the show’s creator, Eric Kripke. Even though many who know about fanfiction think it is harmless fun, there are some authors who reject it fiercely, such as George R.R. Martin, Anne Rice, and Diana Gabaldon. Some authors claim it is copyright infringement and threaten to sue the writers of any fanfiction they see. However, I have never heard of an author suing anyone for writing fanfiction, and no amount of googling can find a case where this happens. It seems that fanfiction remains harmless, for now. There are also many writers who thank their fans for writing fanfiction, such as J.K Rowling. Even more writers have written fanfiction and are not ashamed to admit it.. Meg Cabot, Cassandra Clare, Marissa Meyer, and Andy Weir (author of The Martian) have all written fanfiction. Unfortunately, many of these authors have confessed that their history of fanfiction has often hurt their reputation, but this doesn’t stop them from continuing in their writing. One of the biggest names in fanfiction is E. L. James, whose Fifty Shades Trilogy first started out as Twilight fanfiction but turned into her own original published story. Obviously, this has caused a lot of controversy on whether her ideas and characters are not just parodies of Twilight. I’ll leave that for you to judge. Nevertheless, fanfiction is an interesting creative outlet for any fan who wants to continue the story in their own words. Fanfiction is often posted on such sites as Fanfiction.net, Archive of Our Own, and Wattpad. Fanfiction has created a legacy of new writers who welcome any one who wants to join in on the fun. So if you love writing and reading you should consider Fanfiction as a medium to explore more of your favourite book or TV show. Rachael is a fourth year double-major in English and History. She is both a writer and editor for Her Campus. She spends most of her time trying to multi-task but spends the majority of her day watching Netflix, reading, or hanging with friends.